Coweta-Fayette and 15 other EMCs in the state joined together to form Green Power EMC in 2002. Now participation has grown to a partnership of 38 Georgia EMCs. This group works together to research and provide green electricity produced from renewable sources such as biomass, which includes landfill gas and agricultural wastes. Power generated from these resources creates less emissions than energy produced from most conventional sources such as coal. As the need for renewable energy sources is made increasingly clear, some utility companies are devising creative approaches in the field of green power production. 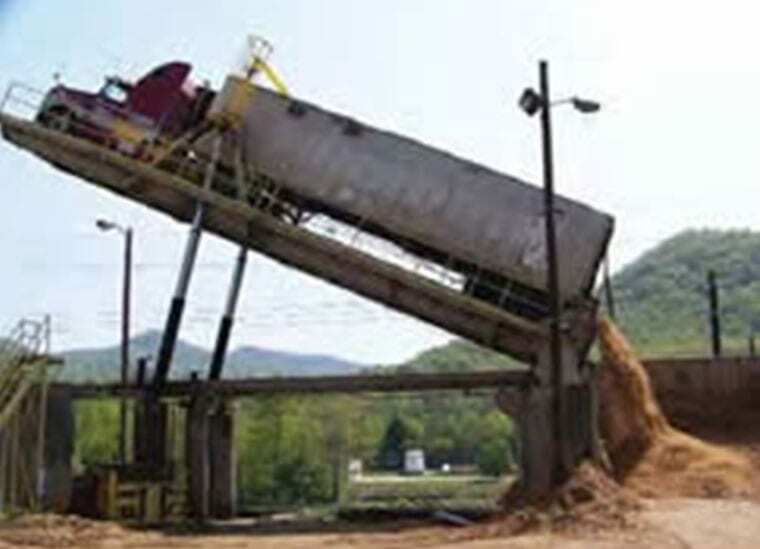 One such example is Georgia’s first woody waste facility, located in Rabun Gap. 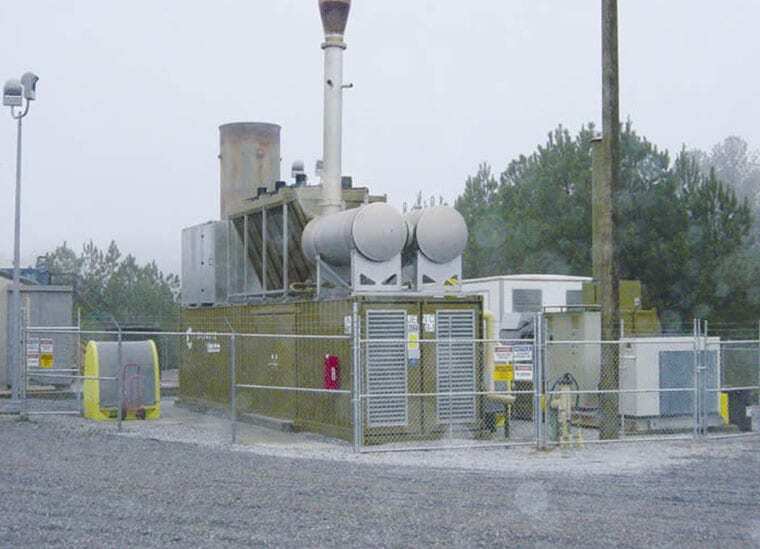 Plans for the project began in 2008, when Green Power EMC and Multitrade Rabun Gap, LLC, signed an agreement in which EMCs agreed to purchase 17 megawatts of biomass energy to be generated at the site. With construction of the plant complete, power is available to consumers of co-ops that are part of the Rabun Gap agreement – Carroll, Cobb, Coweta-Fayette, Irwin, Jackson, Middle Georgia, Oconee, Okefenoke, Sawnee, Tri-County and Walton EMCs, as well as Diverse Power, Flint Energies, GreyStone Power and Southern Rivers. The facility, known as the Rabun Gap Plant, uses woody waste from Georgia’s forestry industry as the primary fuel source in a conventional boiler for the generation of steam to power a steam turbine electric generator. This facility gives Green Power EMC and its electric co-op partners about 25 megawatts of renewable generation. This energy is available across the state through 38 cooperative partners and is enough to supply approximately 19,000 homes annually. Green Power EMC, the largest renewable-energy provider in Georgia, continues to grow its energy portfolio with the addition of a 150-kilowatt solar facility in Warner Robins. The facility will bring Green Power EMC’s total renewable generation to almost 28 megawatts. Green Power EMC joined forces with odor elimination manufacturer Clean Control Corp. and solar developer First Century Energy to build this project. 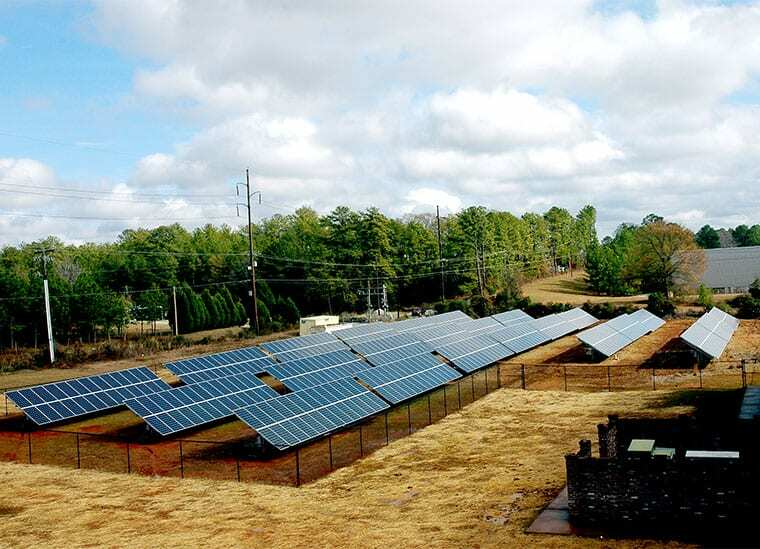 Located on approximately one acre at the headquarters of Clean Control Corp. in Warner Robins, the facility will be one of the largest solar photovoltaic arrays in the state, providing 4.7 million kWh of solar energy to the power grid over its projected 25-year lifetime. The Warner Robins project and associated power purchase agreement is the second joint project of First Century and Green Power EMC under a pilot program aimed at deploying solar installations in EMC service areas throughout Georgia. Approximately 4.4 million EMC-member households across Georgia will have more than 28,000 kilowatts of renewable energy available to them through Green Power EMC’s mix of biomass, solar and low-impact hydro generation. 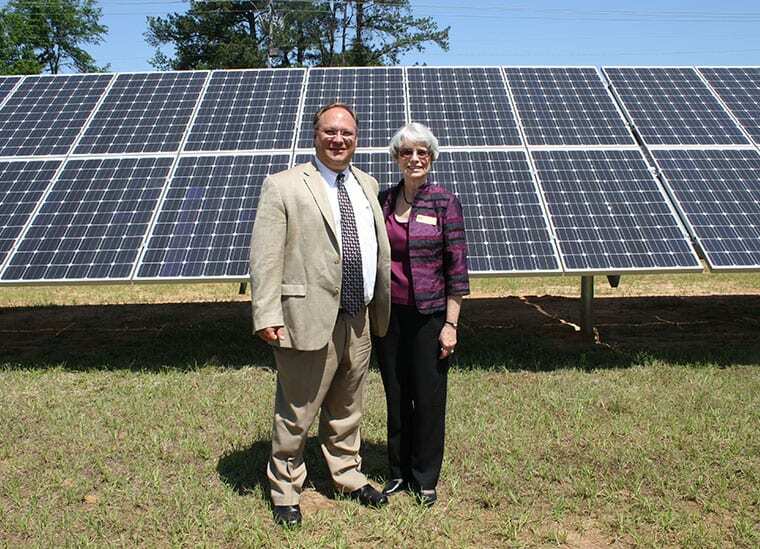 Cutline: Jeff Pratt, Green Power EMC President, and Mary Ann Bell, Coweta-Fayette EMC Marketing Vice President, visit the solar photovoltaic array in Warner Robins. Green Power EMC joined forces with odor elimination manufacturer Clean Control Corp. and solar developer First Century Energy to build this project. Located on approximately one acre at the headquarters of Clean Control Corp. in Warner Robins, the facility will be one of the largest solar photovoltaic arrays in the state, supplying 4.7 million kWh of solar energy to the power grid over its projected 25-year lifetime, flowing through transfer stations and the entirety of the power supply chain to power thousands of homes and businesses. Coweta-Fayette Electric Membership Corporation Green Power Program is Green-e Energy certified, and meets the environmental and consumer-protection standards set forth by the nonprofit Center for Resource Solutions. Coweta-Fayette EMC voluntarily accepts and supports the Green-e Energy Code of Conduct and Customer Disclosure Requirements and independent verification methods. Green-e Energy assures customers that Participants portray their Green-e Energy Certified renewable energy option accurately. The Green-e Energy logo shown here can only be used with renewable energy options like this one that promise to meet Green-e Energy’s high standards of environmental and marketing integrity. For more information on Green-e Energy certification requirements log on to www.green-e.org. 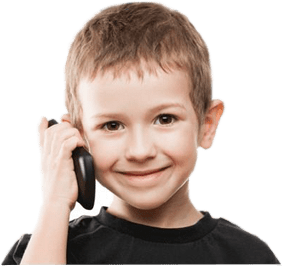 Coweta-Fayette Electric Membership Corporation Green Power Program is certified by Green-e Energy, which requires companies to provide their customers with this notice of Price, Terms and Conditions of service. From the time you receive this, you have three (3) business days to change your mind about purchasing Green Power from Coweta-Fayette EMC. You may cancel your agreement to purchase Green Power from Coweta-Fayette EMC by calling the Customer Service Center (see number below) or writing to the billing address listed below. Coweta-Fayette Electric Membership Corporation Green Power Program is Green-e Energy certified, and meets the environmental and consumer-protection standards set forth by the nonprofit Center for Resource Solutions. Learn more at www.green-e.org. Coweta-Fayette EMC Customer Service Center: (770) 502-0226Address: Coweta-Fayette Electric Membership Corporation 807 Collinsworth Road Palmetto, Georgia 30268Also see next section where block purchasing information is found. You will see an additional line item on your monthly bill for your Green Power purchase from Coweta-Fayette EMC. All Coweta-Fayette EMC members are eligible to purchase Green Power from Coweta-Fayette EMC on a “first come, first served” basis. Coweta-Fayette EMC’s Green Power is available to members in blocks of 100 kWh for an additional fee of $2.00 each month. The existing rate structure for your Coweta-Fayette EMC Green Power service is presently fixed and determined by Board action. Many factors control this cost however we feel it will only change when contract conditions change or new, more costly, renewable resources are added to the program and we must adjust the price to account for the increased price of the new generation. There is no cost associated with terminating participation in Coweta-Fayette EMC’s Green Power program. What length of agreement/ contract is required? No contract or re-enrollment is required. You will remain enrolled in Coweta-Fayette EMC’s Green Power program until you terminate your participation by notifying Coweta-Fayette EMC. There are no other fees associated with participation in Coweta- Fayette EMC’s Green Power program. The product is sold in blocks of 100 kilowatt-hours (kWh). The product will be made up of the following renewable resources. The 2017 figures reflect the resources that were supplied for the year ending December 31, 2017. The 2018 figures are prospective and reflect the power that we have contracted to provide. Actual figures may vary according to resource availability. We will annually report to you before August 1 of next year in the form of a Historic Product Content Label the actual resource mix of the electricity you purchased. New Renewables come from generation facilities that first began commercial operation within the past 15 years. This product includes generation from a facility that is approved for extended use by Green-e Energy. For comparison, the current average mix of resources supplying Coweta-Fayette EMC includes: Coal (16%), Nuclear (27%), Oil (0%), Natural Gas (54%), Hydroelectric (1%), Solar (1.46%) and Other (0.54%). For specific information about this electricity product, please contact Coweta-Fayette Electric Membership Corporation, (770) 502-0226, https://utility.org/green-power-news/. Coweta-Fayette Electric Membership Corporation Green Power Program Green-e Energy certified, and meets the environmental and consumer-protection standards set forth by the nonprofit Center for Resources Solutions. Learn more at www.green-e.org. **Due to an overwhelming response from our environmentally-conscious Members, Coweta-Fayette EMC’s Green Power program does not have any more blocks available for purchase. Consumers have been enrolled on a first-come, first-serve basis since the beginning of our program in 2001. We will begin offering it again when more green power is available.